“Nowhere to Run” by Martha and the Vandellas as some newly assembled Mustangs make their way along the assembly line while the line workers try to concentrate on doing their jobs. Check out this video of Kalle Rovanpera, the 8 year old son of Harri Rovanpera. 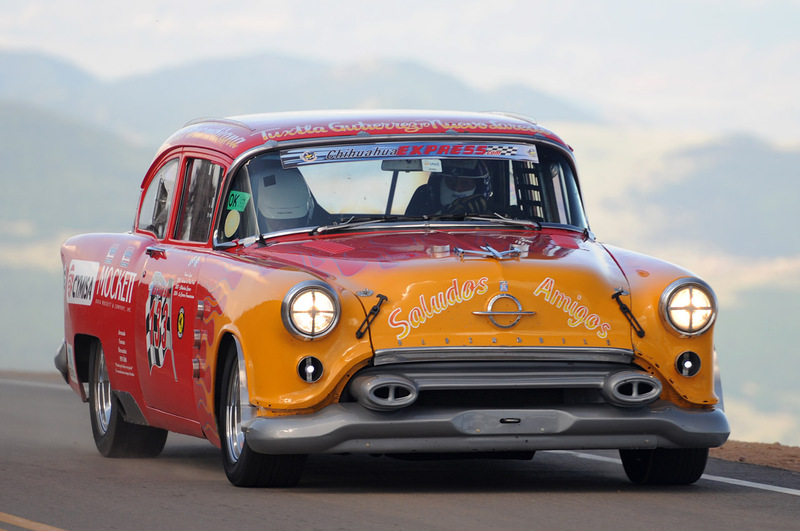 Harri will be driving one of Mats Hammarlund's car in this years La Carrera Panamericana. 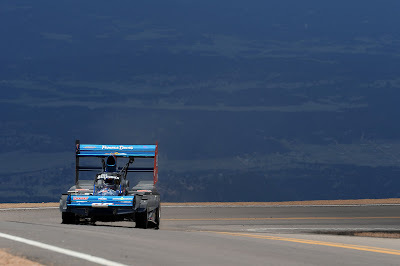 This years Pikes Peak was pretty exciting with many of my friends turning in awesome results in overall and class. With the exception of Paul all of my friends have raced in the world famous La Carrera Panamericana which begins at Guatemala and ends back at the United States. Congratulations to all of you. My friend Paul Dallenbach fought a valiant fight not only against the mountain but he had to overcome just about every hurdle a racer hopes will not show it's self. Paul finished second overall which is simply unreal considering he did it on a very small budget while others in his class had all the monetary resources they needed. In short... for them money was no object. Paul had very little time to test like everyone else did because he had to change engines which meant he had to run an engine with less than a hundred less horsepower. If that were not enough he had to deal with fuel problems as well as brakes. Not once did he complain as he just did what real racers do... deal with the matters at hand and play the hand that was dealt him all with amazing results and all this with no excuses. What a fine gentleman racer. Just imagine what he would do had he had the right sponsor. Some other good friends who performed extremely well are Doug Mockett and Angelica Fuentes who won the Vintage Class. 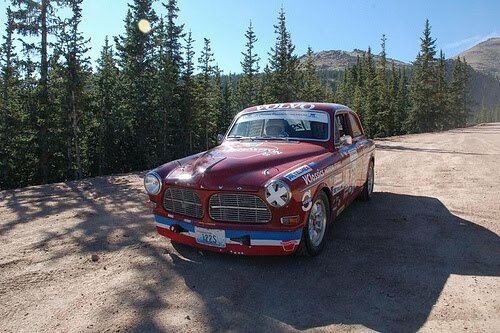 Another good buddy to mention is Richard Bailey for doing a great job in his Volvo also in the vintage class. Another friend is none other than Karl Scheible who took a second place in class in his Subaru and was only 1.5 second behind the Australian National hill climb Champion. And here are some other cars that ran. Plans are being made for another Carrera Fiesta at the Monterey historic races or reunion on Saturday evening, August 14, at a nearby Mexican cantina. Please put it on your calendar. Details will be circulated shortly. As some of you in the Bay Area already know, Diane and I sold our home in Half Moon Bay and moved to Foster City on Monday. Our new address and phone number is listed below. 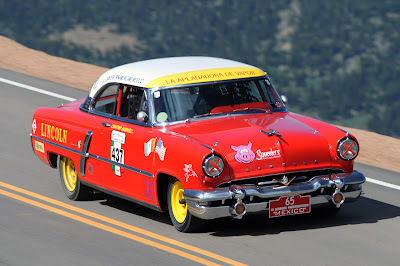 The Organizing Committee of the Carrera has not yet updated the rules for 2010 on the official web site www.lacarrerapanamericana.com.mx. It is not unusual for the final rules to be promulgated in the summer or early fall. However, I do not expect any significant changes. As I understand the current rules, a HANS device or similar SFI or FIA approved head and neck restraint will be required in all classes, as it was last year. And, although the rules are not clear, it seems that a fuel cell of some sort is required in all cars, including the Historic and Pan Am classes, too. Last year, for the first time, a two-layer driving suit was required. A one-layer suit and Nomex underwear was deemed to satisfy this requirement, however. Nothing has been said about fire-resistant driving gloves or shoes. In 2011, according to Mr Eduardo Leon, the event will include the first generation Chevrolet Camaro with a small block engine. To obtain the required insurance for your tow rig, and optional coverage for your racecar (when it is not in competition), go to the web site of Baja Bound at http://www.bajabound.com/?r=panamrace or call them toll free within the U.S. 888.552.2252. Make sure you tell them that you are participating in La Carrera. All competitors, especially those new to the event and those shipping a racecar to Mexico, should send their application for a racing license and two small photos of their face (like on a driver's license) to the offices of the Federation of Mexican Auto Sports (FEMADAC) in Mexico City. It is not necessary to send payment ($260 USD) with your application. You may pay the fee in Tuxtla Gutierrez when you pick up the license. You may download the application in English from http://femadac.org.mx/pdf/solpan.pdf. Their address is on the form. Any competitor using the services of a Mexican customs agent to import their tow rig and racecar into Mexico must also send another application to FEMADAC. 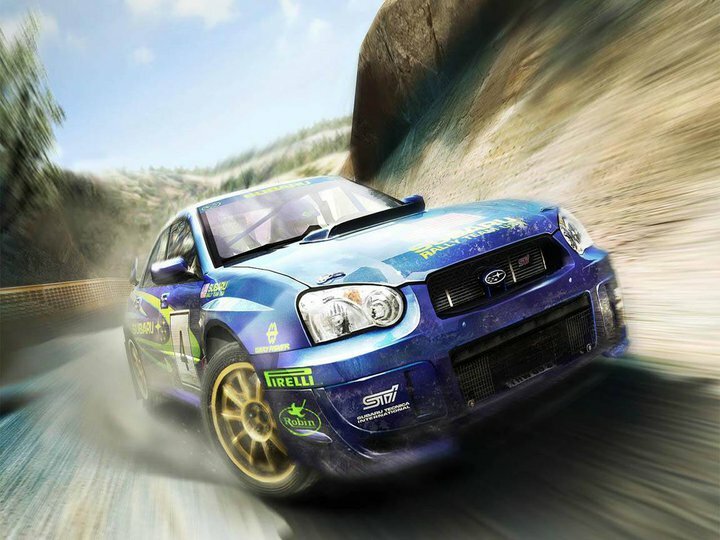 You may obtain this form by clicking on http://femadac.org.mx/pdf/FORMA_IMPORTACION_RALLIES_ingles.pdf. Include a check for $150 payable to FEMADAC. 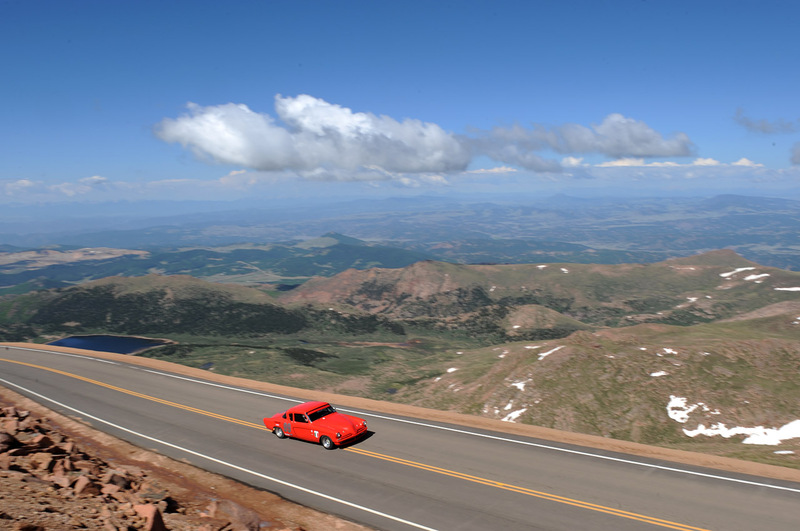 If you plan to bring your tow rig and racecar in on a Temporary Tourist Permit, as most of us do, you do NOT need to file this form and pay the fee. Temporary Tourist Permits may be obtained on the Internet by going to www.banjercito.com.mx. If you or your service crew plan to join the Coyote Convoy for the trip down to Tuxtla Gutierrez, please let the North American coordinator know at gbledso@aol.com. The convoy will gather at the Residence Inn del Mar (Marriott) in Laredo, TX at 8 PM, Friday, October 15, and will cross the border early the next morning. If you stay at the Residence Inn, make you own reservation via Marriott, and ask for the Carrera's group rate. Driving at night or driving alone from Laredo to Monterrey is not advised. It is 540miles from Laredo down to San Miguel de Allende, and it takes about 11-12 hours with rest and petrol stops. This trip must be accomplished during daylight hours. Sign up for the special Coyote Convoy email list, too. By this time you should have contacted Monica Grossmann about your extra hotel needs for the event. If not, please do so immediately at monica.grossmann@yahoo.com. The Carrera Office has announced that it has signed up 120 entries for 2010, and registration is closed. They claim to be maintaining a stand-by list, but have announced no procedures for this process. Last year, they had 107 sign up, but only 100 cars start the race. I would assume that there will be several no-shows this year, and that a couple of North Americans on the stand-by list will be allowed to participate, but I do not know when any announcement about openings will be made. But who wants to show up in Tuxtla and take a chance? The other day a good friend and I were discussing the importance of having a good driver in order to win and while I agreed with him I also mentioned that even the top drivers in the world have no control over situations than can (and do) arise almost every day during a major endurance race such as La Carrera Panamericana. Today my good friend Mats Hammarlund of MH Racing reminded me of something that took place during last years race. This is a story about what can happen in the Panamericana. As I have said earlier, Stig didn’t have one single problem during the whole race. That is why he won with 13 minutes. I think it was equal part preparation before the race, service during the race and Stig saving the car. Even though I felt sick in my stomach everythime I saw him start at 6.000 rpm and sidestepping the clutch! Anyway, he did have one problem that would have been hard to prepare for. Waiting for the start at the day after Guadalajuara, he opened the door to let in a little bit of air. It is hard to imagine how hot it gets inside the cars with the racing suit in the middle of the day. The ambulance of the organization drives by and SMACK!! The door looks like a banana. 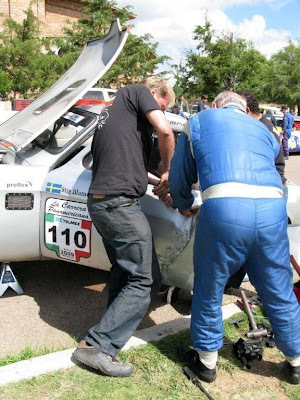 Only minutes to the start, Stig finds something to tie the door shut and takes off. I think he won the stage (he was probably pretty mad) and luckily after this stage is the service. Stig walks up to me and asks very calmly ”Do you have an extra door”? I said WHAT!!? No we didn’t have an extra door so instead we started a frantic body shop session to make the door shut. We took it off and took turns jumping and banging on it until we got it to close again. 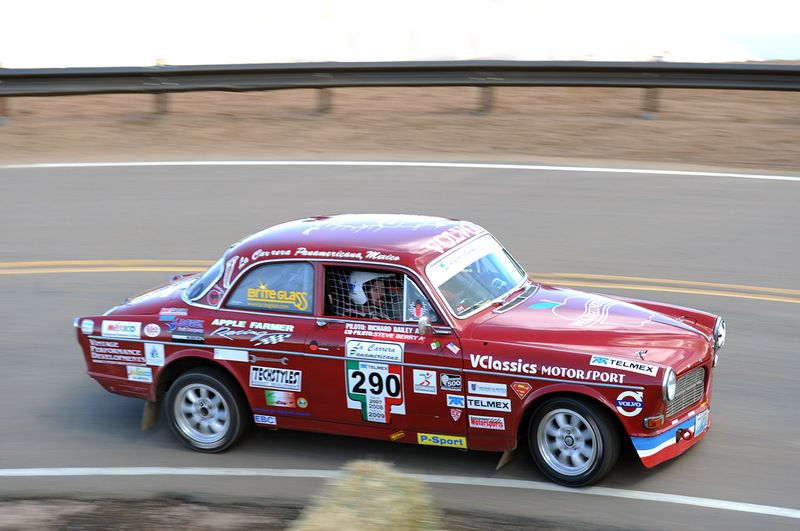 This is just a little story about how hard the Panamericana is. No matter how hard you try, it is hard to prepare for everything. My good friend Mats Hammarlund just informed me that he has a couple very talented drivers which will be driving his two Studebakers in this years 2010 La Carrera Panamericana. Michel Jourdain and Harri Rovanpera! 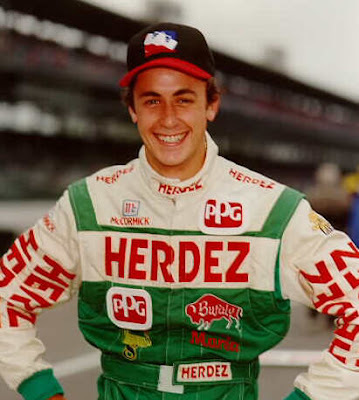 Michel is without a doubt the most famous Mexican race car driver right now. He had a long career in Indy Racing league and CART (Champ Car) including several starts in Indy 500. He raced full time in Champ car between 1997 and 2004. After joining Rahal Letterman Racing he became a championship contender with several wins and many top three finishes. After that he has raced in both NASCAR and the World touring car championship. Right now he has switched over to rally with a group N Mitsubishi. That transition seems to go very well with a win in the Spanish National Championship so far. Harri Rovanpera is one of the best rally drivers in the world. 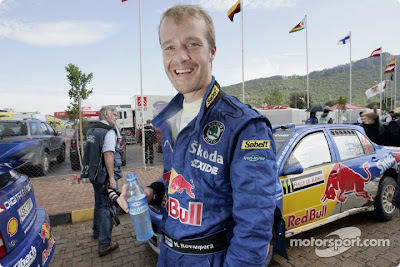 He competed in the World Rally Championship from 1993 to 2006. During that time he drove for many of the top factory teams. He has 111 WRC starts with one win, 2001 in the Swedish Rally and 15 podiums! It will be very interesting to see how he handles the transition from the small, 4 wheel drive WRC cars to our big Studebaker. In either event if someone were to ask me which one I was intimidated by more my immediate response would be one word, "Neither". Having been involved in endurance racing so many years the one thing I know for a fact is you have to finish to win and there is a LOT of things waiting in Mexico to see that you have at least one bad moment which can mean all the difference in the world. I hope everyone will join me in wishing my very good pals Kevin Jones and Mark Williams who raced with us in the 2007 La Carrera Panamericana all the best luck as they embark on one hell of an awesome Harley Davidson adventure. One thing I feel compelled to say is for those of you who have not had the pleasure of meeting these two awesome individulas I can't begin to tell you what a couple of standup personalities they truly are and I can'y help but hope the very best for them. On June 20th, 2010 some of the world’s most fearless riders will come together for a 7,000+ mile run from Key West, FL to the Kenai Peninsula in Alaska. Across two countries we will ride and test our will as warriors in the Hoka Hey Motorcycle Challenge! Many are called but few will be chosen. Only 1,000 chosen individuals – those who can hear 10,000 horses hooves thunder across the prairie as they ride into battle – will be counted among the most elite riders to ever straddle a steel horse. In the same manner as the finest military organizations, the chosen few will receive a numbered challenge coin, minted with the Hoka Hey Motorcycle Challenge Logo. And, at the end, there lies a HALF MILLION DOLLARS in ALASKAN GOLD for whoever reaches the final checkpoint first. There is no prize in a warrior society for second place. Every Harley-Davidson™ dealership in the world has been invited to participate so riders should prepare to be challenged not only by the Hoka Hey Motorcycle Challenge Organizers but by riders from around the globe! It is with great excitment that I post the following news release about a very special, long time friend of mine and his wife. Having known Bob since the early 70's the one thing I can tell you about him besides his amazing driving history is that he never ceases to amaze me or his friends with what he's up to next. Bob Bondurant and Gary Faules having a good time at Bob's track after Bob invited us to spend the day testing on our way race in the world famous La Carrera Panamericana in Mexico. MONACO – Bob Bondurant, of "Grand Prix " movie fame and founder of the Bob Bondurant School of High Performance Driving in Phoenix, Ariz., got married on the Monaco Formula 1 circuit on May 14, 2010. Among a very excited crowd of onlookers, Bondurant and his new wife, Patricia, said their "I do’s." Bod saying their I do's on the track. The couple, who had already officially married in the U.S., had a handful of friends and family as witnesses and approached the joyous occasion with aplomb. 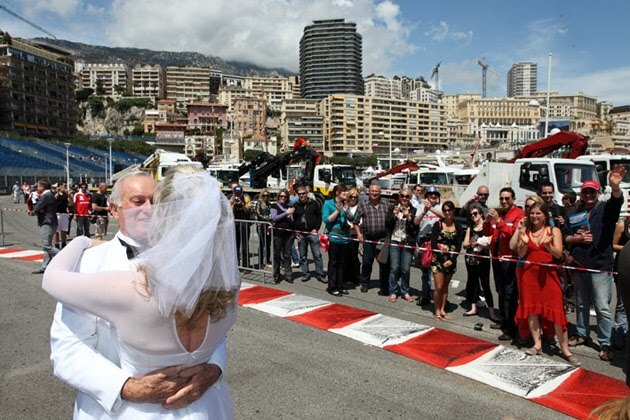 The Monaco Formula 1 enthusiasts could not believe their eyes as they certainly were not expecting to see anyone get married right on the race track that day! As for Bondurant, he could think of no better place to exchange vows than on the very same circuit that earned him 4th place back in 1966 and where he worked as a consultant on the now famous movie "Grand Prix" with James Garner. Nowadays he is better known as the leading authority on advanced driver training and has been at the forefront of professional driving instruction since the late ’60s. Utilizing the Bondurant Method, over 250,000 students ranging from housewives, racers and celebrities to teenagers, professionals and police officers, have learned from Bondurant’s expertise. In 1967, he joined the Dana Chevrolet Team in the growing Can-Am and USRC (United States Road Championship). That year while racing at Watkins Glen, a broken steering arm caused a crash at 150 mph, rolling his car eight times and ending his promising professional racing career. Faced with the possibility of never walking or racing again, Bondurant went back to what he knew better than anyone in the world: maximum car control. On Feb. 14, 1968, the doors opened at Orange County International Raceway, near Los Angeles, with three students. The next week there were two students, Paul Newman and Robert Wagner, training for the film "Winning". Bondurant was technical advisor, camera car driver and actor-instructor for the film. Ever since then, both Bondurant and his school have enjoyed success after success. Frank Damgaard of Monte-Carlo Weddings, who coordinated all the logistics, admitted that it was certainly the first wedding of its kind in the Principality. Our favorite nurse in Mexico, Lupita Hernandez, needs your help! Lupita lost both of her legs at the hip when a Pan Am racecar crashed into an Red Cross ambulance near Tuxtla Gutierrez back in 2003. Please email your bids to – LCP395@aol.com. 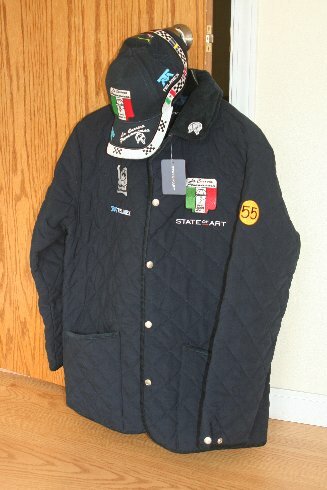 The reserve is $500 USD for the coat, hat, and an official Pan Am ballpoint pen. Bidding will close on July 4. The ensemble will be mailed, insured, to the winning bidder in the U.S. or overseas. The payment check will be made out to "Carrera Friends of Lupita Hernandez" and sent to her trust account in Los Angeles. We need your continuing support. Thanks for bidding. According to the President of the Organizing Committee, Eduardo de Leon, 120 competitors have signed up for the event this year. This is the biggest registration since the first years of the event. The largest group will be from Europe, with North Americans and Mexican entries following in second and third. At this point in time, 35 North Americans (Canada and the U.S.) have signed up, filling the allotted spaces. Two competitors are on a contingency list, and a few more are still working hard to prepare their cars and find sponsors. Sadly, the event is effectively closed to any more registrations. Technically, the Pan Am is limited to 100 cars because a public highway in Mexico may be closed only one hour for a rally. However, with the cooperation of the Federal Police, it is possible to squeeze a few more cars down the highway the first couple of days. After that, attrition will reduce the number of cars starting each day. Normally, about 60% of the serious accidents occur the first day or two, largely because the drivers are too excited or overly ambitious. They tend to forget that the Pan Am is really an endurance race -- seven days, 2000 miles. What is the future of the Pan Am? This is a frequent question, especially from those contemplating the building of a racecar for the event. Who wants to invest $50,000-150,000 USD in a purpose-built rally car, if the Pan Am won't be around? Remember, these are not cars prepared for vintage racing, but hot rods with modern engines, steering, and suspension systems, etc. In fact, the only thing that might be old on a Turismo Mayor car (the fastest class) is the body, and even some of these body parts are being replaced by fiberglass. There is an excellent chance that the event will be around for several more years. It may become more difficult to close some roads for top speed racing, but more speed stages could be moved to some of the new racetracks being constructed throughout Mexico. As more toll roads are built, this will take pressure off the old highways, where the competition tends to take place. Of course, there are politics in all things, and a different government might have a different view about closing highways for full bore racing. Bottom line? Get down to Mexico to race as soon as possible! Ray Crawford (Alhambra , CA) was one of the great gringo names associated with the original Carrera. Like many of the current Carreraistas, Crawford loved the event and raced his own Lincoln all five years. A hard-charger, he did not finish the first four times out, but in 1954—the final year of the event—he finished first in class, defeating all the factory entries. In 1951, 1953, and 1954 Crawford’s car was equipped with a 16mm camera, like those found in U.S. combat planes. This is not surprising since Crawford was a P-38 pilot in WW II with seven kills to his credit. Apparently, he showed some of this film to civic and car clubs in Los Angeles, but later the film was “lost” in the back of his garage. Now the film (17 reels) has been discovered by his family and is being restored. Reportedly, 14 of the reels were salvaged by the film’s new owner, Ron Kellogg (www.kelloggautoarchives.com) and the results are remarkable. Mr. Kellogg is looking for a business partner to edit the films properly and perhaps market them to a TV production company. I have volunteered my services to provide background information and script for voice over. If all goes well, some of the films may be seen in Monterey at a Carrera Fiesta on August 14. If you are interested in helping this project along, please let me know. Being a spectator at the Carrera is extremely difficult unless you have a driver or guide who knows how to get you close to the action or a helicopter. On the first day, for example, the cars race 325 miles from the city of Tuxtla Gutierrez in the state of Chiapas north to the city of Oaxaca. Currently, there is only one route between the two cities, the original Panamerican Highway. The racecars will leave downtown Tuxtla Gutierrez at 8:00 AM on Friday, October 22. Watching the ceremonial start of the race is always interesting, but if you do that, you will not be able to see the cars actually racing once they get outside of town. To watch the cars race, skip the ceremonies and go out to either the first or second speed run an hour before the racecars leave town. Pick a nice, safe vantage point, and wait. In an hour or so, the cars will come speeding by. Take mucho video or photos. After the 120 cars pass, you will trapped behind the race. It is virtually impossible to watch them by pass by again this morning, unless your ‘copter is waiting. A good driver or guide will be able to get you ahead of the race during the service stop for lunch. You may not have time for a leisurely lunch break, but you can move up the road to a second vantage point to watch the cars go by one more time in the afternoon. Alternatively, you may go on to the city of Oaxaca and watch the cars enter the main square, the Zócalo, in the late afternoon. The advantage of going on to Oaxaca is to have some time to see this beautiful colonial city before the race arrives. You may not have time to visit the impressive Indian ruins of Monte Albán, but you can walk around the downtown area (el centro historíco), check out the cathedral and maybe the market where Indian crafts are the featured items. On the second day of the race, your choices are about the same. Skip the ceremonial start of the race in the Zócalo and go out to a safe spot in the mountains to watch one of the morning speed runs. Take some water and snacks, too. If you do not want to watch, then travel down the toll road toward Puebla to greet the cars when they arrive at the mid-morning service stop. After this service stop, you can continue down the toll road to the city of Tehuacán. Make sure you are there when the race cars arrive at the main square. There will be thousands of people in the square, plus music and dancers. The festivities in Tehuacán should not be missed. You can also grab lunch at a restaurant on the main square. After lunch, head back down the toll road to Puebla. If you hurry, you can catch the racecars in the beautiful main square in Puebla, too. Check out the cathedral there, as it’s truly monumental. The Chihuahua Express is scheduled for April 8-10, 2011. This is a great event because: it is nearly as much full-speed racing as the Carrera, but packed into only three days. It is only 145 miles from the U.S., and you return to the same luxury hotel room each night. The rules are the same as the Carrera, except that any car (with a full roll cage) may participate. Last but not least: it is relatively inexpensive. For more information, go to www.chihuahuaexpress.com or email the North American Coordinator for a brochure at gbledso@aol.com. 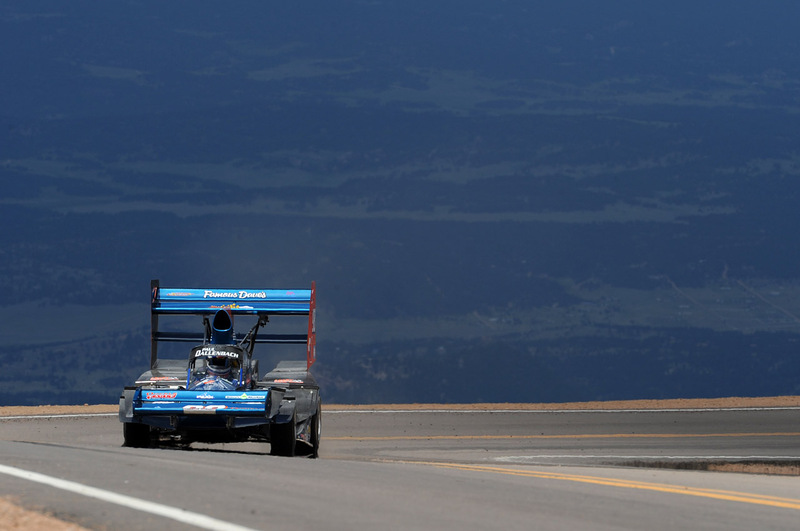 Several Pan Am cars will tackle Pikes Peak again this year. Doug Mockett and Angelica Fuentes will return in an attempt to reclaim their trophy as king and queen of the mountain. Todd Landon will have two or three Mustangs in the event, too, including Doug Allen (Co.) and Thierry de la Bosque (Belgium). Charles Breed will be there in his Chevy Lister. This year the vintage class will be divided into real vintage cars and those, like most Carrera cars, that are modified. Pan Am vet and former SCCA rally champ Karl Scheible will also be running a Subaru in the "Race to the Clouds." 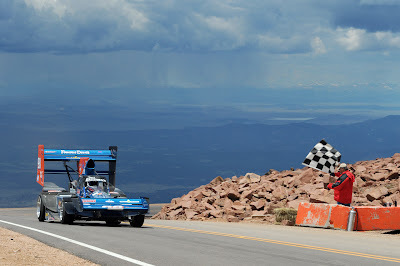 Go to www.PPIHC.com for a complete list of entrants. Date: June 27. There is no cost for participating in the convoy except for the hotels along the way and any group meals. Spectators are also invite to tag along. Put your name on the mailing list for convoy news: gbledso@aol.com. After the race, a convoy from Zacatecas back to Laredo, Texas is being organized. ACE DRIVING GEAR. Tired off driving suits that make you look like the Pillsbury Dough Boy? Tired of suits that don’t show off your girlish figure? There is a solution: have a suit made for your unique body – at a very reasonable price – in the USA. Ace Driving Gear has designed a suit with the rally driver and navigator in mind, too. It offers nine pockets and even pen-pencil holders in the sleeve for navigators. Most importantly, the suits are Nomex and SFI 3.2A/1 rated. The vintage look is really unique. MATS HAMMARLUND RACING – need a racecar to rent or built for next year? Mats will also store your car at his big shop in San Miguel de Allende for the Chihuahua Express and the 2011 Carrera. Contact Mats Hammarlund at mats@mhracing.com.mx. Four of Mats’ cars took four of the top six spots in 2009, including overall winner. TODD LANDON MUSTANGS – Todd has twelve years of Carrera experience as a racer and car builder. One of his cars finished first in class and fifth overall in the Historic C class in the Express last month, and the same car won the Historic C class in la Carrera, finishing in fourth overall. Todd also offers an “arrive and drive” arrangement, with full mechanical support. Email him at TALandon@landolakes.com. THE PAN AM TOUR – if you want to see the race up close and personal ride along with Rosa María Mondragón racecarmedia@yahoo.com.mx. 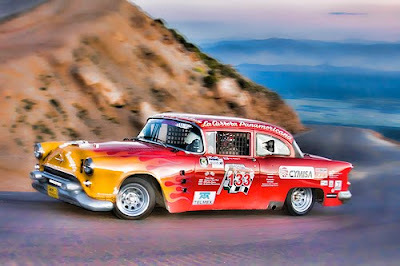 Because of the nature of the event—racing on public highways all day for hundreds of miles—the event is a challenge for spectators and photographers. The best option is to rent a car and experienced driver, or take the Pan Am Tour with Ms. Mondragón. Rosa, the former PR director for the race, takes 4-6 spectators with her for an exclusive insider’s view of the event. Hang on, because she is also an experienced rally car driver and Pan Am navigator. She will get you close to the action and important people. 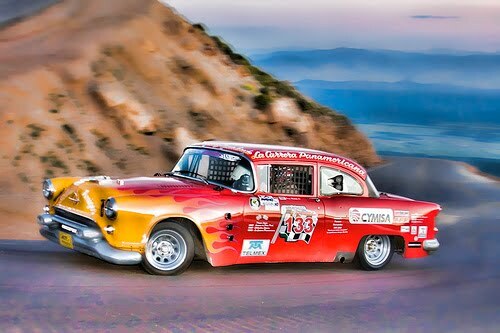 WARNING: Please remember than La Carrera Panamericana is a pro- or stage rally that involves high speed driving over paved roads and tracks for seven days. It is a serious motor sports event, and as such, is dangerous. Even the transit stages run in regular traffic can be dangerous. Participants, at any level of competition, should take every precaution to ensure their safety, and should drive their vehicles with appropriate care. As it has been said many times, just finishing this event is a victory. And finally, may we never forget the 175,000 Allied troops who hit the beaches of Normandie 66 years ago, and the four thousand Americans who lost their lives that day.